And no-one of value was lost. Lolzipops. Because your not openly mocking here. Your hypocrisy is embariassing, and the comic is obviously awesome. No sense of humor, either since this comic is amazing. Deal with it! Stupid Muthafucka! Thank you for reading. Not that you’ll ever see this comment. Saw this comment. love the comic :O===== GOOooooOD WOOooooORK. Probably a good thing he didn’t get to the other religious comic then. Lol! Referring to ‘religion’ as ‘magic’, that’s gonna make some people cross. Pardon the pun. Indeed! He should have used “Fairy tales”. anything would have worked really… I still would have offended them. As far as I see, he did not mock religion -this far [new reader here]. This one strip only mocks wild, pulled-out-of-my-bottom-parts doomsday hype. And a little known fact is, that most Christians find these things as stupid as most sane people. Not that they don’t believe in the 2nd coming of Jesus (aka “the Last Day” or “Judgement Day” or “End of the World”), but they believe that no one knows the date of that day. But I don’t want to repeat myself too much. Ah knew, that you could. And that is a perfect summary of atheism. basing our beleifs on the rationale presented to us. still, i kinda miss being christian. being able to rest me weary head on gods shoulder helped me survive childhood. Prayer was pretty cool also, i mean, the prayers of atheists are lonely, drunken messages left on the answering machine of the universe. But thats ok. following what you beleive in in the face of adversity is one of the best things to do in life. Actually, what you describe there is Skepticism. Atheism is simply lacking a belief in a god. There are many non-Skeptical atheists out there, most have either never seen a point in believing in a god, or reject god but follow other supernatural things, as I once did. Some come to Skepticism through Atheism, some come to Atheism through Skepticism. 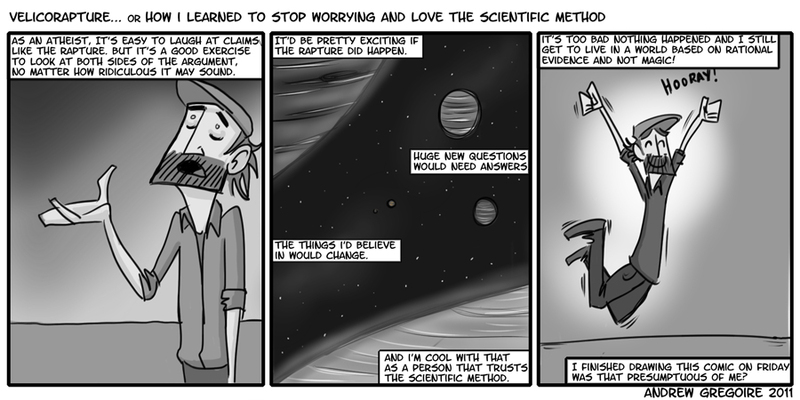 But Skepticism is the foundation of Science. Agnostics lack belief in or against god. Atheists actively believe that there is no god. Skeptics doubt the truth of a religion (e.g. Christianity), and as such could be either Agnostics or Atheists. However, Skeptic is also a philosophical standpoint with varying degrees of doubt in knowledge of the physical world, ranging from a belief in the empirical nature of the physical world to solipsism. There is no Rapture in the Bible, of course. So it’s like a stupid topping on a three-scoop stupid sundae. Personally I’d love to be able to believe in magic sky people looking out for me, but I just can’t. I am a Christian. Does that mean I thought the world was going to end? Does that mean I’m going to reject science in favor of my own strict literalist interpretation of the bible? No, quite the opposite in fact; I’m probably one of the most logical minded people out there. I understand science, and fully believe what it has helped us discover. In its most pure form, religion does not conflict with science; extremists just give it a bad reputation. Hello! I stumbled upon this comic from questionabe content and wanted to say that your comic is boss. I love it. Especially your drawing style, it’s magnificent. Ha, and I can’t stand the people that belive the rapture is even mentioned in the bible, yet whole-heartedly support even more baseless and ludicrous claims. How did you develop your drawing style? I’m just sort of curious. Thanks dude! Religious or atheist, it only gets annoying when people decide to convert others to their point of view. Besides, alot of atheists believe in experiments they have never tried themselves. They believe in them because they read about them in a book. Similar to how people believe that Jesus walked on water. This isn’t to say that the scientific evidence is wrong, I certainly don’t believe that, but alot of people have no more reason to believe them than religious people have to believe in the bible, until they actually put down the schoolbook and replicate the experiment for themselves. That being said, people who believe they can use mathematics to decipher encrypted messages in any book to predict any event in the future should not be allowed to get any media-coverage. Especially considering how many lives are ruined by their popularity. As a traditional Roman Catholic (I mean that I go to a has held in latin on Sundays), I have some objection to the comparison between religion and magic. (Note: I do find this comic funny, I just feel the need to get my 2 cents in here). Secondly, the one thing that the bible DOES say explicitly about the apocalypse, is that we have NO IDEA of when it’s going to happen. Period. End of story. And finally, is the idea of certain defined rules and principles by which the universe operates REALLY all that different from the concept of a god or gods? P.S. – I’m really glad that the rapture really didn’t happen, because it would have been a really sucky birthday present, especially if I WASN’T taken. P.P.S. – The bit in the previous comic about leaving condoms along with the clothes was hilarious. And once again I am reminded of how much I hate autocorrect: I typed in “mass” and it put in the word “has”. I guess like the first comment you probably wont see this one, since this comic is old… It’s easy to laugh at things like the rapture from any point of view, even for Christians. It isn’t actually in the Bible. Least not any versions I read. I think the book of revelations is a pretty good blueprint for bad choices a society can make as long as you look at most of it as a metaphor. I actually get an email for every comment so I do read EVERY comment. I believe in God, but my opinion of the Rapture was the same as most anybody’s: It seemed like anybody with latent suicidal ideations was eager to get on the bandwagon, to find some excuse to stop confronting life’s inevitable challenges. I recently considered giving up atheism. I have been looking at all the afterlifes, and have decided that if I do choose to believe in a higher power, it is going to be Odin. just 3 panels of a webcomic, cos I just think that’s freaking hilarious. I blame your comment box for the format fail. Ugh.. Really? Just like an Atheist to take what one senile stupid old man says and use it as proof against religion.. To be an atheist is one thing.. But to be an ignorant one is another.. If your gonna say the bible is trash, know whats in the god forsaken book… Ps. The bible basically went against everything that crackpot man said.. Which is why he lost his show not long after the whole mess.